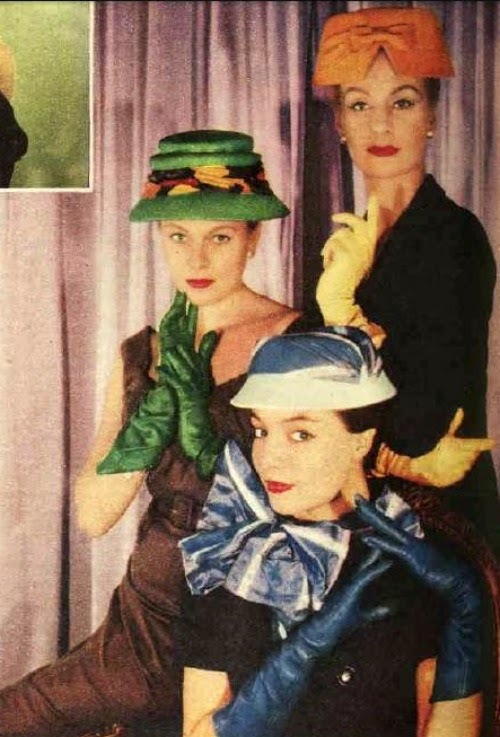 I'm back with more 1950s millinery fashion research, courtesy of the pages of the Australian Women's Weekly. I do look at other digitised Australian publications, but, although they often have good written trend reports, the picture quality is usually too poor to share. Also, this instalment should have been from 1955-1957, but apparently I didn't like anything much in the 1955 issues! So we start on the 25th of January, 1956, with some advice on "When to wear a hat" from Betty Kemp, the AWW's fashion advice columnist. 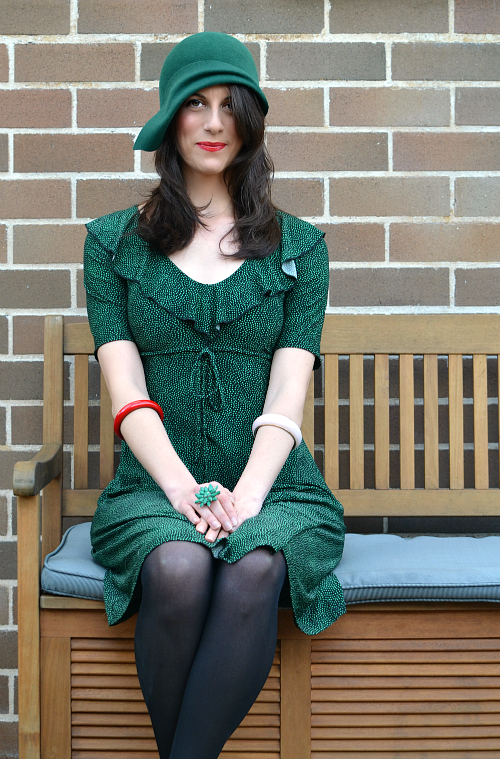 "A Hat should be worn to the races, to a formal lunch, and to any afternoon or after-five function in a public place." 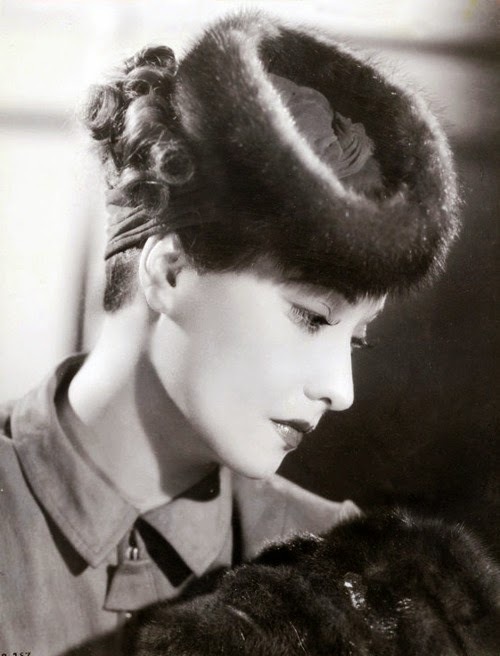 "It is much better to have several hats to suit changing moods than one expensive all-purpose model." 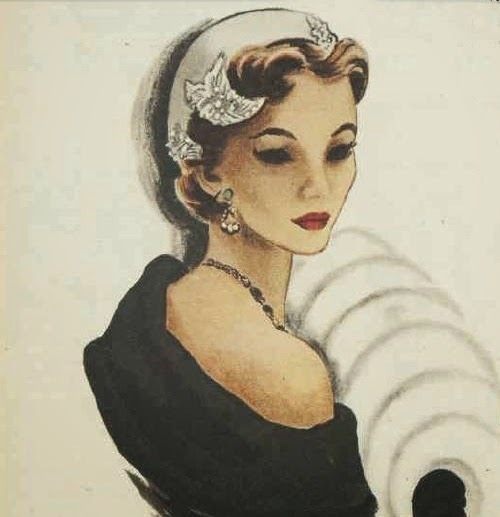 In the previous instalment covering hat fashions 1952-1954, it was all about small hats. By 1956, the tables are turning. 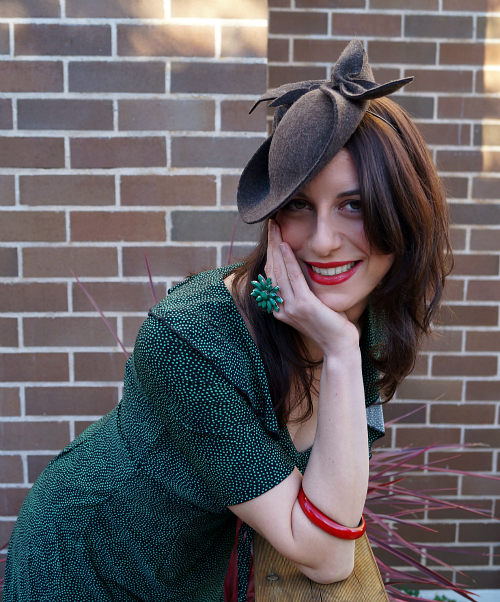 This poppy-red hat is representing the new "heavy" autumn look. 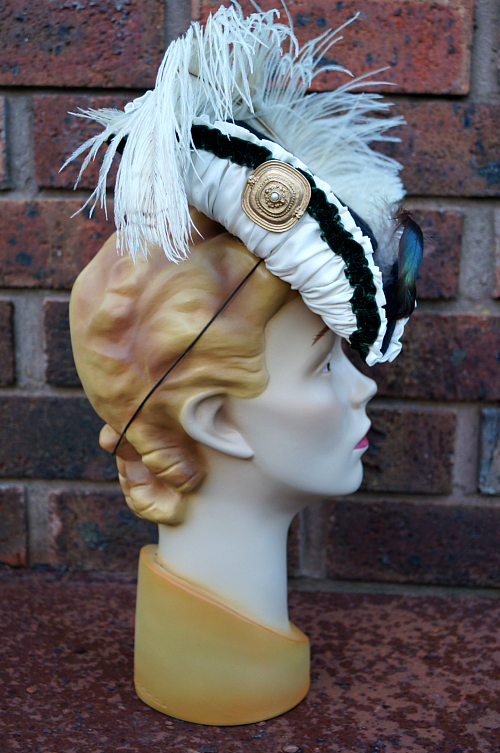 This feathered cocktail hat from Madame Vernier is just too delicious not to share! 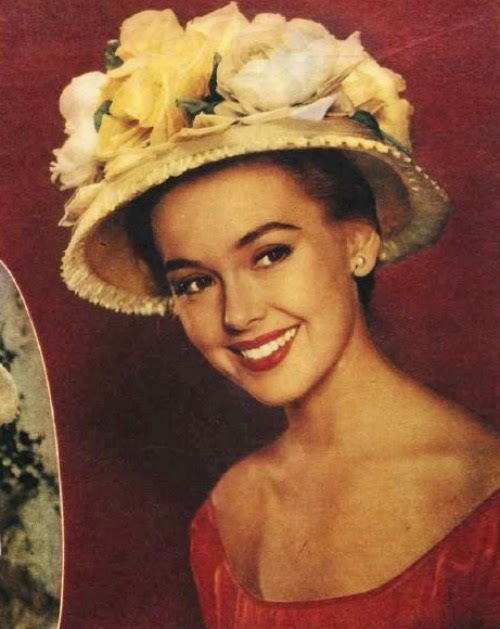 At this stage of the 1950s we are already starting to see hat shapes that I have long associated with the 1960s - flowerpot and "upside-down-basin" shapes. And also vibrant colours like yellows and oranges appearing a lot. 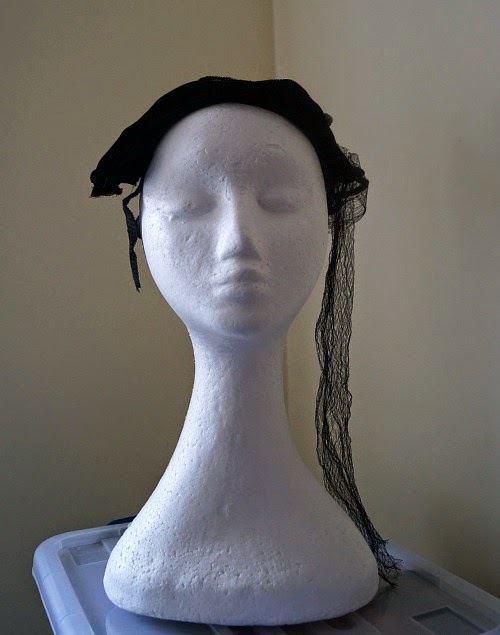 The caption states: "New millinery note for next winter: Little hats have bigger proportions." Is anyone else seeing a millinery Charlie's Angels here? This photo accompanies an article about "The New Bulky Hat." 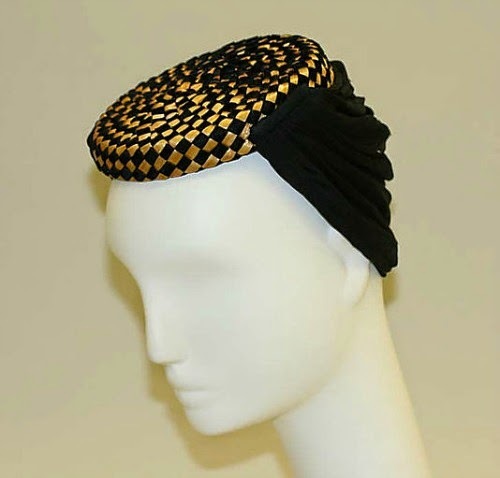 "Hats have reached a turning point in fashion. After years of shrinking, they have suddenly blossomed into bulky importance. The advantages are seen quickly. 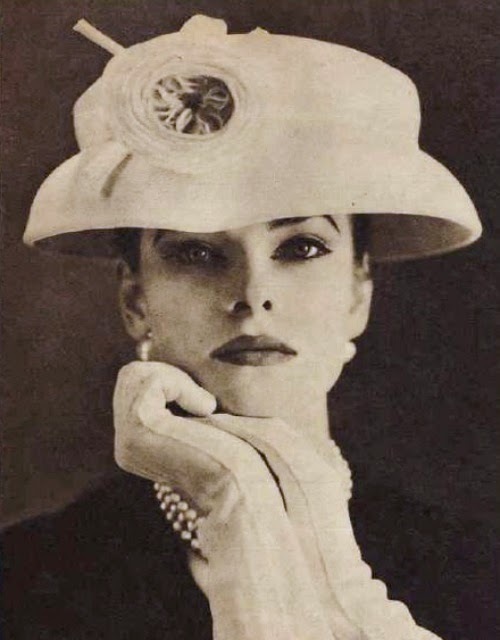 For one thing, a deep or wide brim makes the face beneath it look deliciously feminine or piquant. It also gives eyes an extra look of allure. And, finally, bulk is the logical counter-balance of a slender silhouette - and a real flatterer to bared or fur-covered shoulders." 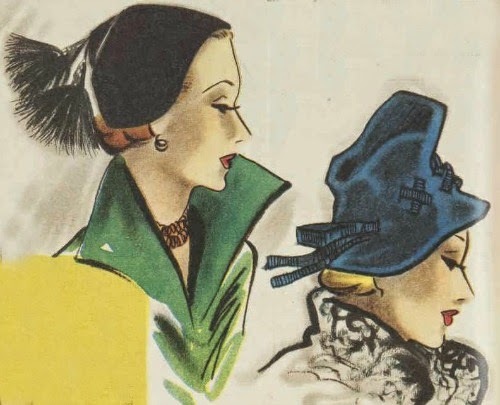 So as our tiny half hats were paired with cocktail dresses with large flaring skirts, thinner lines of dress bring with them a trend for bigger hats to provide a contrast. "There is no disagreement on two fashion items: the slender super-elegant line and the bulky hat. ", states the 1st of August edition. 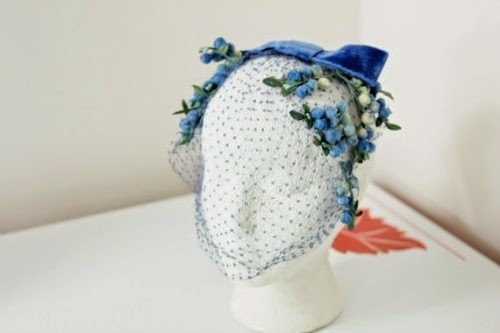 "I am planning a spring ensemble in a floral material consisting of a frock and jacket, and would like your advice about the hat to wear with it." "I suggest a hat of self fabric. 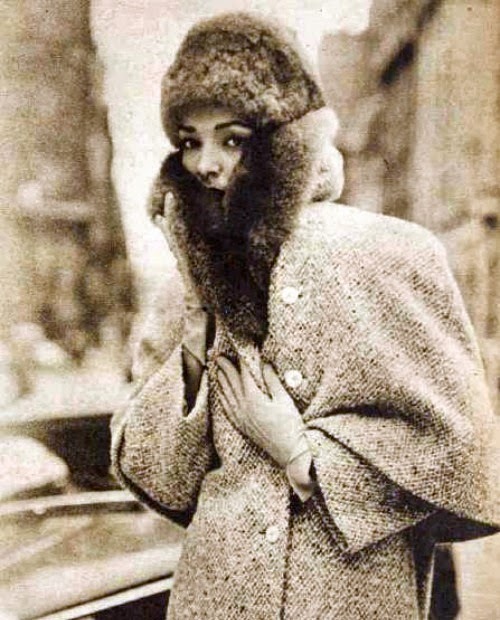 This matching-hat-to-complete-the-costume look is very new in Paris spring fashions." 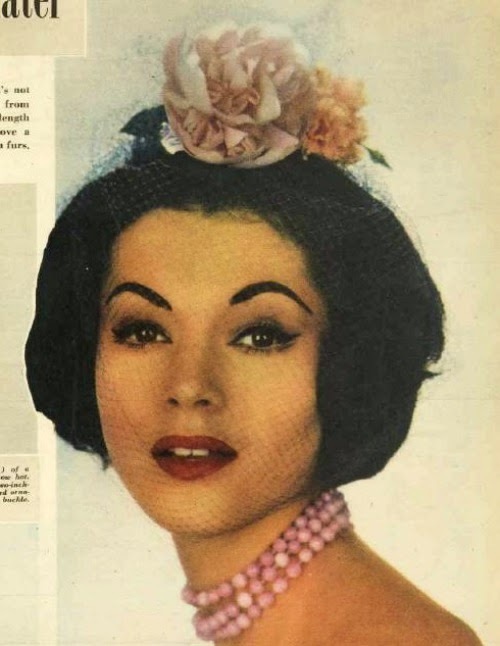 Coming into the spring of 1956, hats are still large, but now are also "Laden with flowers and extravagant with color, the hats are designed to wear above an understated dark day dress, a late-day, or little dinner dress." I think we know by now that I love fur hats. 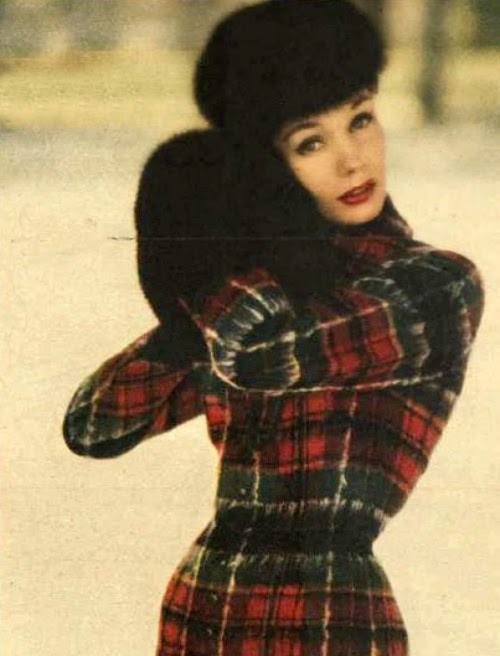 This black fur hat and muff paired with a red plaid is by Jacques Fath, and is pretty much to die for! Back in Autumn fashions in 1957, fur is everywhere and in every shape. "The kind of fashion era coming up is full of clothes for the fashion adventuress, some startling enough to knock the sunglasses off your nose right now. It is also a romantic feminine season in which ethereal chiffon, white fur, black velvet all help to create the clinging-vine illusion." 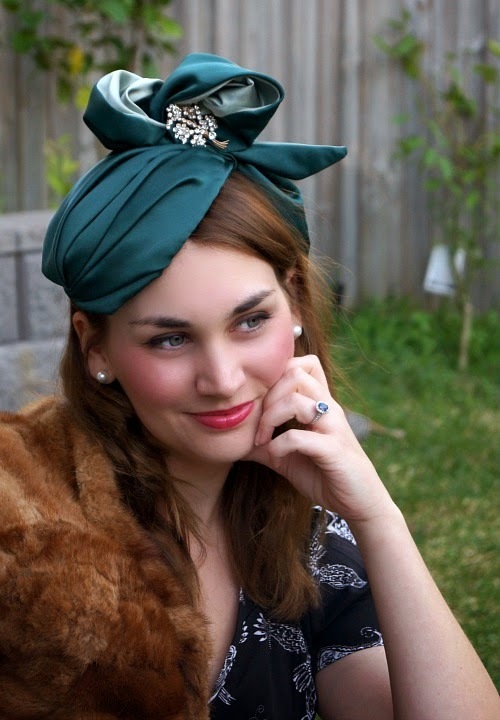 "Every woman will be fascinated, too, by autumn millinery. Hats this season are quite a power in fashion..."
As well as fur, turbans are mentioned, and we are told to expect a lot of jewels, feathers and veils in hat trimming. 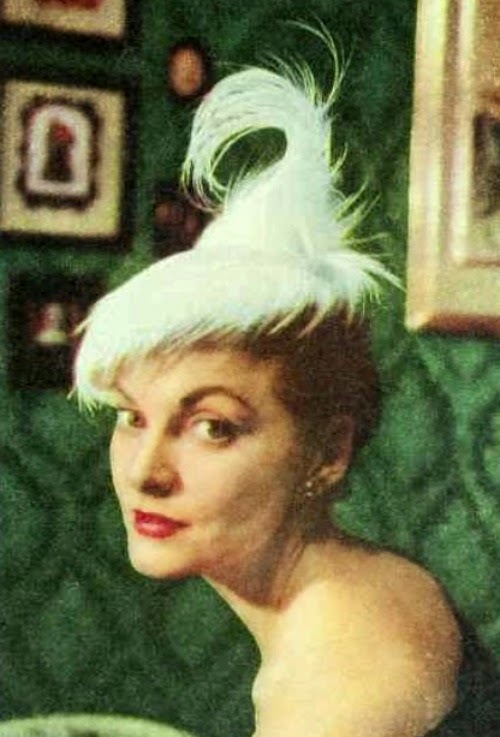 In March, 1957, we see evening headdresses from Paris (and they are quick to point out that this is not a "hat") that look to me like the classic whimsy, and may be the start of their fashion introduction. 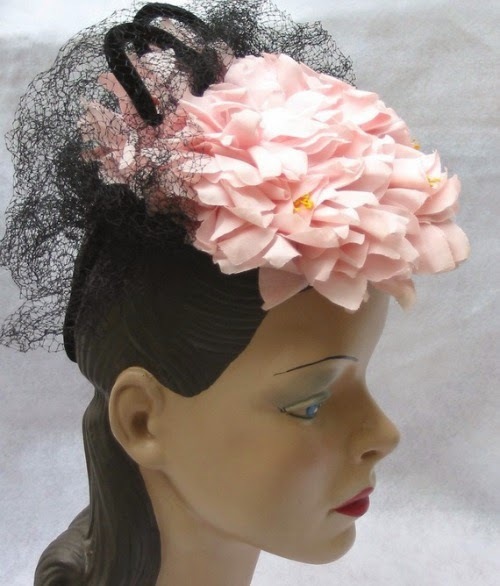 This one is just roses and veiling. 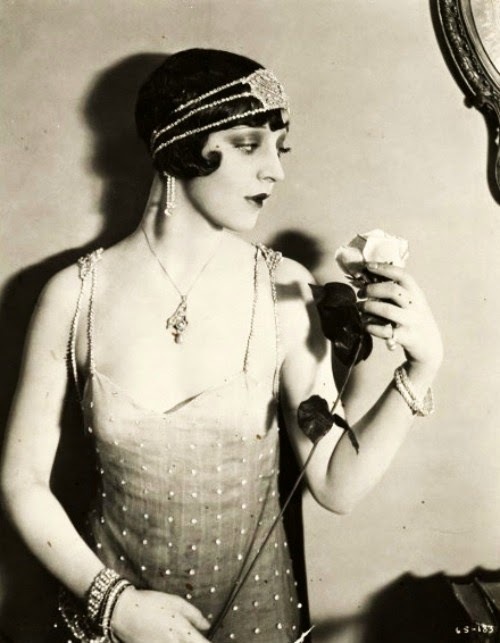 I think that whimsy styles reached greater fashion heights (if not physical heights) later, based on the examples I've seen, but this is still an elegant look if you have the right outfit to match it with. I wanted to share this photo particularly because I feel this would be such an easy look to recreate. 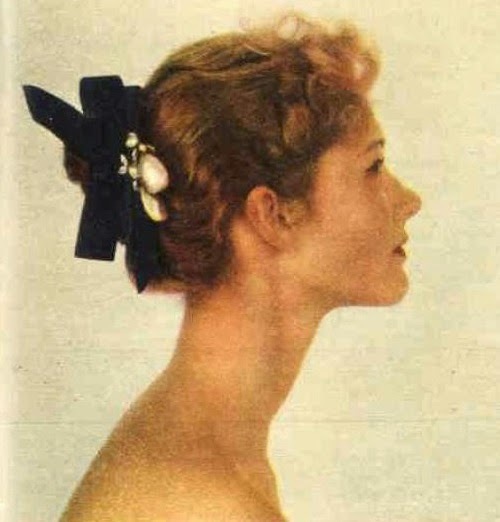 It is an "After 6 p.m." look, and described as simply a chignon up-do decorated with velvet ribbon and a drop-pearl-and-diamond ornament. 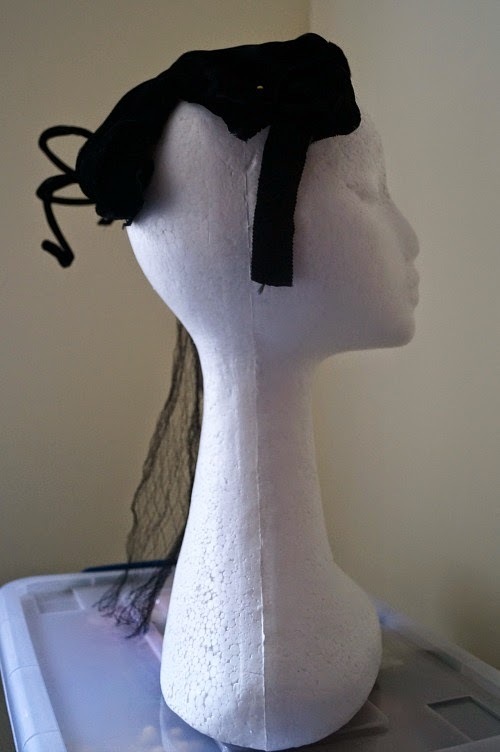 Maybe something to try with some spare ribbon and a nice brooch or elaborate pendant? 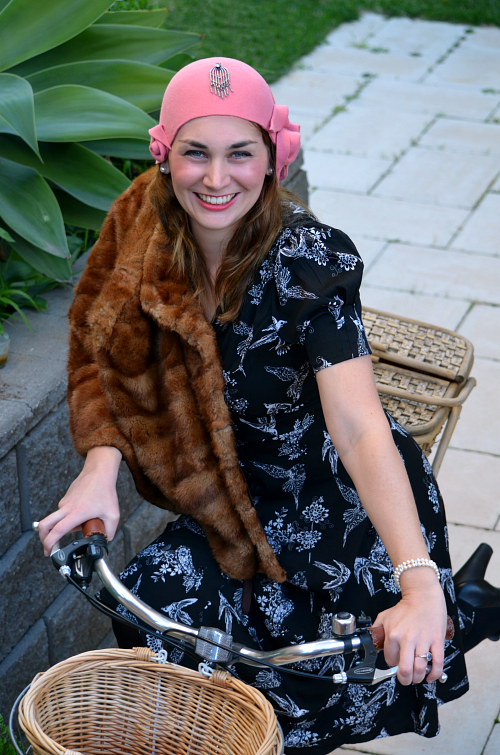 The July 10th issue of AWW is all about Turbans. Ok not really, but this stunner features on the cover, and the fashion feature article shows an immense range of turban shapes and styles, in all kinds of materials, including self-fabric to match the dress. Again, we're seeing the exaggerated heights that we go on to see in the 1960s begin their journey here. 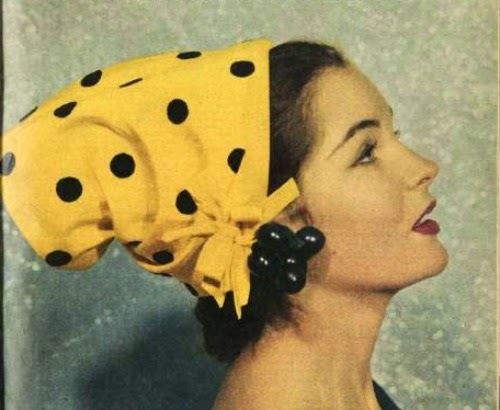 I hope you enjoyed this continuation of our ramble through the hat fashion trends of the 1950s. Which styles are your favourites here? 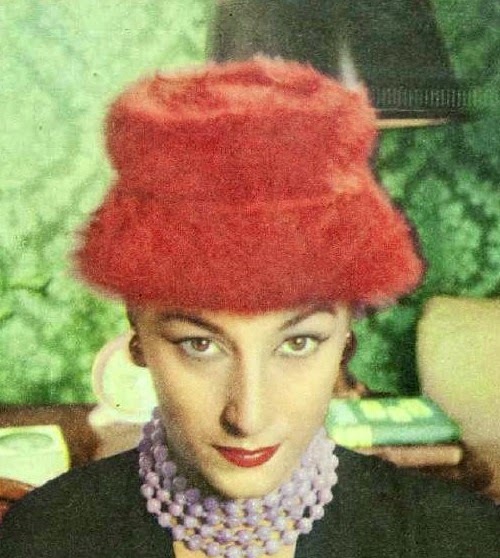 And do you prefer the bulky hats of 1956-57 or the small caps of earlier in the decade? As we speak, I'm being kicked from the inside to remind me to tell you all that I'm starting to gear up for maternity leave. I'm working hard on preparing blog posts to continue throughout, but it does mean that some of my recent work will be shown to you in a very drawn-out manner, as I try to make it last until I start up making again next year (I hope). I'm still making things now, but I'll be slowing down, and probably stopping at the end of September, for a break of at least 4 months. Don't worry though, the Travelling Hat project should be out in the world by then, and I still have lots of other things to share! While I'm focusing on the 1950s, I wanted to share with you not only my own creations, but some of the genuine vintage pieces that I am privileged to own. I had a wonderful day of modelling fun with my friend Ruanne, and there will be more from this day over the coming weeks. 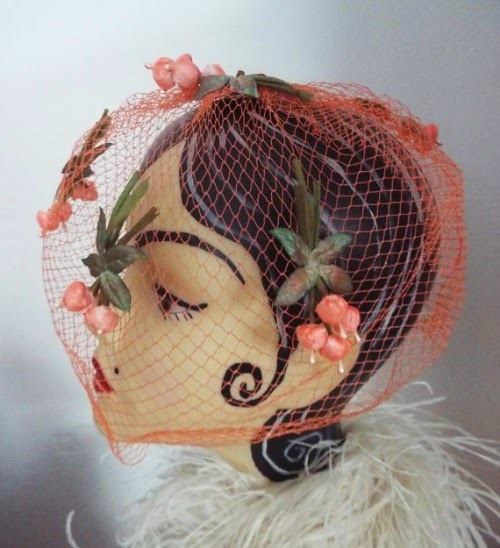 One of my grandmother's friends and neighbours, and a lovely woman, showed me this 1950s cocktail hat that she owned and wore when younger. I admired it, and took lots of photos so I could attempt my own version someday, but then a few weeks later, she gave it to me! The veiling is very badly damaged, but I don't feel ready to take the step of replacing it! I'm a bit sentimental about this generous gift. 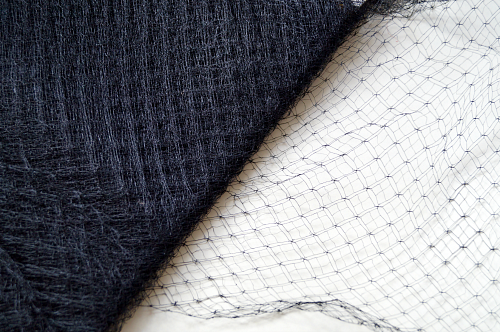 I think I will replace it one day, when I find the right pattern of veil. This one came in a lot of 1950s hats that I bought recently. Most of them are damaged to some extent, and I bought them to fix up and sell. This is one of the few that are still in near-perfect condition (only general wear and fading, and maybe a bit of damage to the feather). It looks almost white, but is really a very pale mint green, with trim in a pale peachy apricot colour. I think that between us, we wore this hat a lot during this photoshoot! 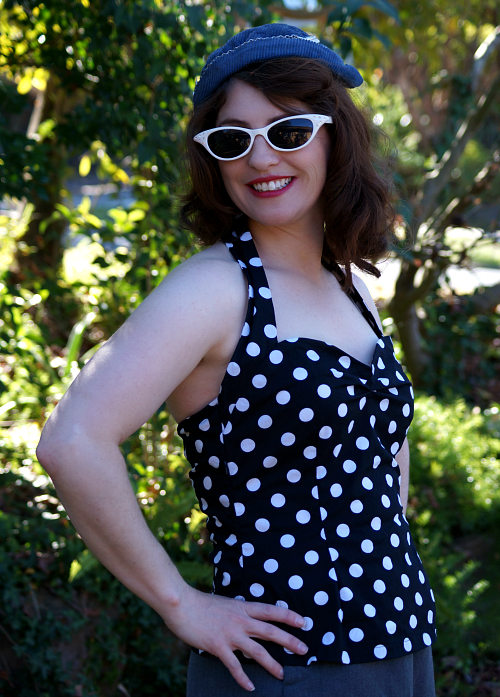 It is very comfortable and easy to wear, and more flattering than I imagined when I first unpacked it. And it goes with a range of outfits! I love the freedom of non-matching that the 1950s gives you. I seem to often see fashion photos and sketches with a range of bright colours worn together, and I love it! I tend to be conservative about colour, so I'm having fun stretching my wings a bit. I thought I could draft a pattern from it, which of course I haven't yet done. We had more trouble dressing to match this one, as it is a little more casual and not well suited to the floral dresses. 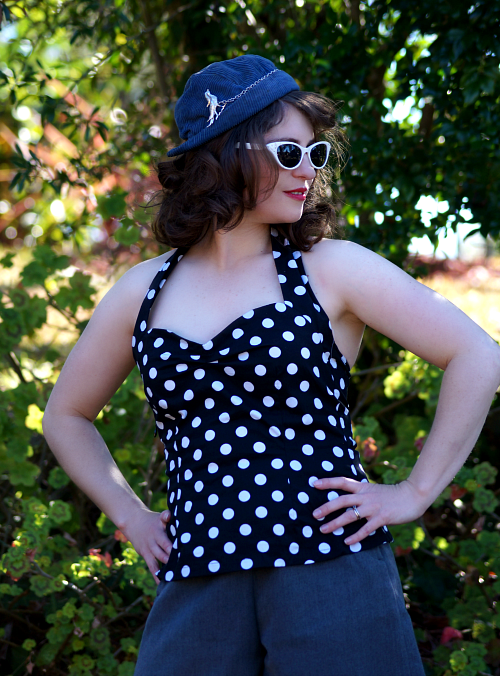 Then Ruanne put together this pin-up style top and shorts combo and we had a winner! I love the pheasant brooches on the top. I'm not sure if they are actually sweater clips, that this enterprising woman has put onto her hat, but that's my suspicion. 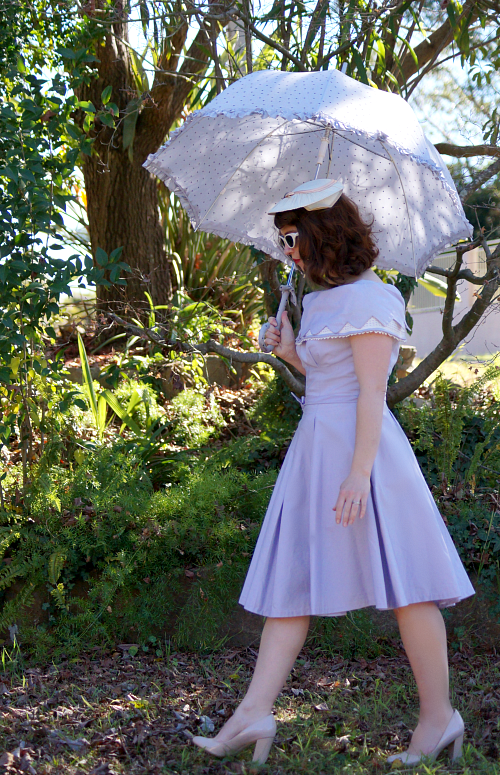 We took too many good photos in this shoot, so there will be a Part Two to the vintage collection shots, as well as some of my own 1950s-inspired hat creations, and some vintage-style maternity outfits with hats too. 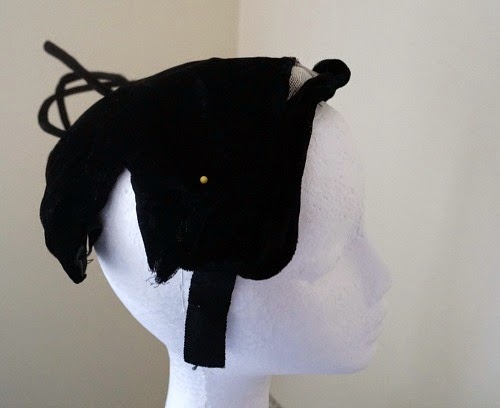 Earlier this year, I floated the idea of adding repair of genuine vintage hats to my handmade millinery, and the suggestion was met with approval. Which is great, because I really wanted to do it, and probably would have anyway! It's nice to be supported by other people as well though! 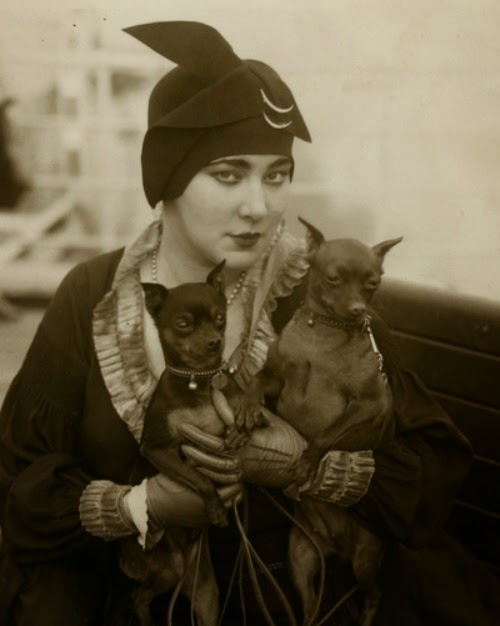 I have since then obtained a significant number of vintage hats in need of varying degrees of love and attention. Today I want to show you the first project I intend to take on. It's a bit of a doozy. The veiling is a bit limp and lifeless, but not in terrible condition. This whole job will be mostly mending, reshaping, cleaning, and reattachment. I have to do my best to work out which way around it goes, and how exactly the shape and trims would have gone, which is not going to be easy. I'd love to hear your wise opinions! The good thing at least, is that I can hardly make this hat too much worse! That's exactly the kind of project I love. What can I say? Wish me luck! 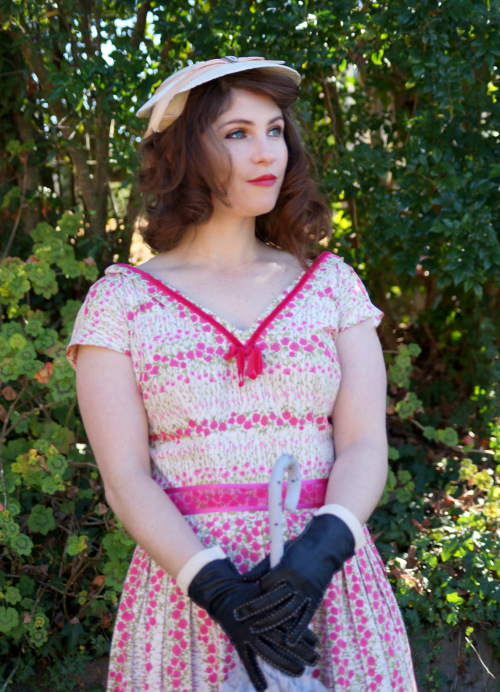 Some of you may be aware of (and may be participants in) The Sisterhood of the Vintage Dress, hosted by Joanna at Dividing Vintage Moments. 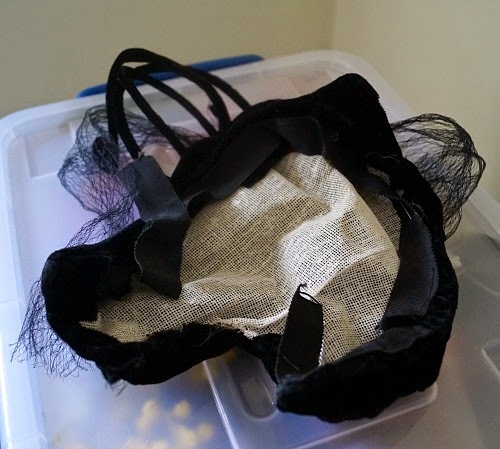 The dress is going to travel the world, being posted from participant to participant, and each person wears the dress, takes photos, and posts it on. I would have liked to participate, but I'm not in a great position to fit into regular clothes. I love the idea however, and I immediately thought about sending one of my hats on such a journey. 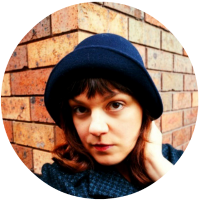 This is what I would like to do: Design and make a hat, and send it around Australia and the rest of the world, with people wearing it and sharing photos. I'd love to hear whether this is an idea that appeals to people, and any suggestions or requests as to what kind/period of hat I might make for it. 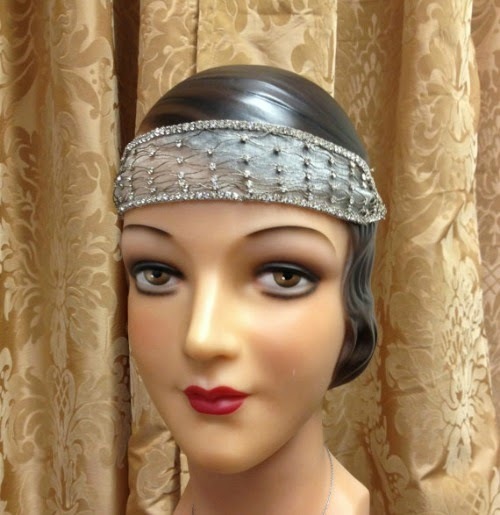 I'd like to do something vintage, as my main interest at the moment, but I don't know beyond that. 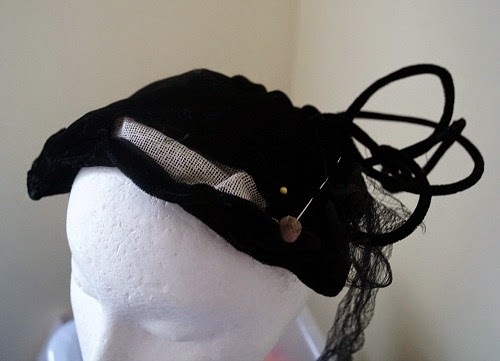 I'm going to try to make it something relatively small so postage isn't ridiculous, something that will fit any head size and be quite versatile with regards to styling. 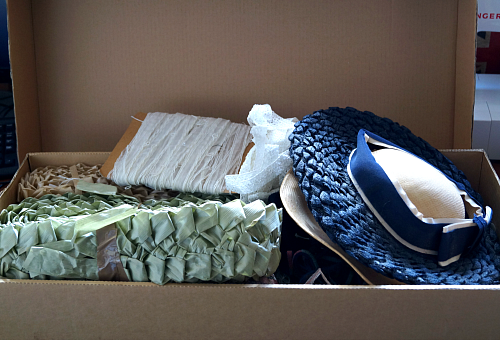 If I can find a small-but-pretty box, the participants can sign that as it travels, too. Etsy seller MyVintageHatShop, sold. I've wanted to make one since I saw it! 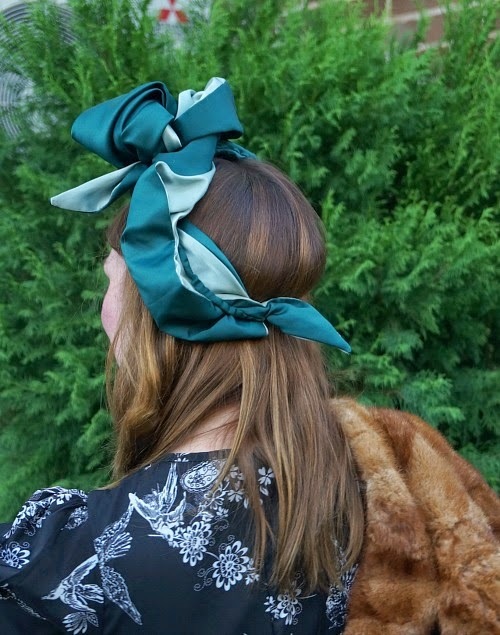 Would you participate in a Travelling Hat experience? 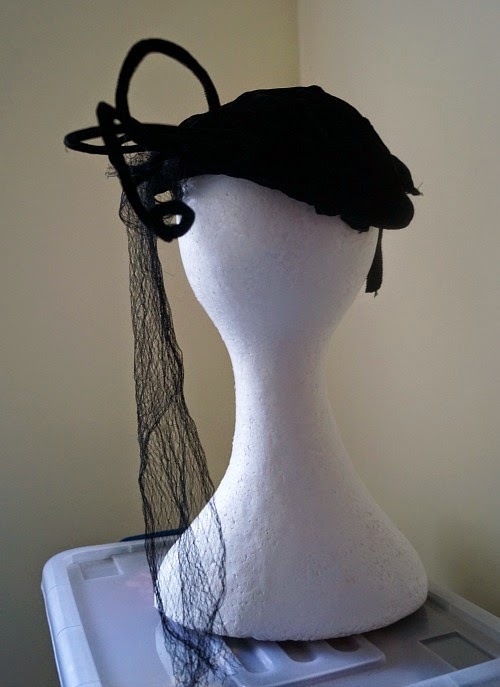 What kind of headwear would you like it to be? Any other suggestions for portable hats? After much individual consideration, the voting panel have submitted their votes, and we have arrived at a winner. This was really hard, as we loved all the entries! 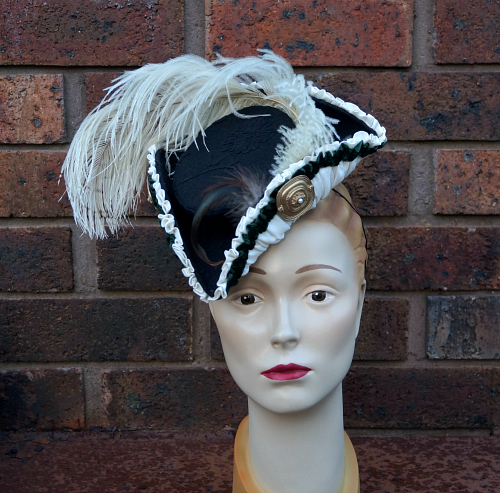 ...who chose the "Countess Charlotte" Miniature Tricorn. Congratulations Penny! Send me an email at tanithrowandesigns@gmail.com and I will get your hat to you ASAP. Thanks so much to all who entered. I really loved reading about how and where you would wear my hats and could imagine all these outfits. It was great fun for me. I hope you all enjoyed it too. Also big thanks to everyone who shared the competition around, and my lovely voting panel (I know we all had trouble choosing). 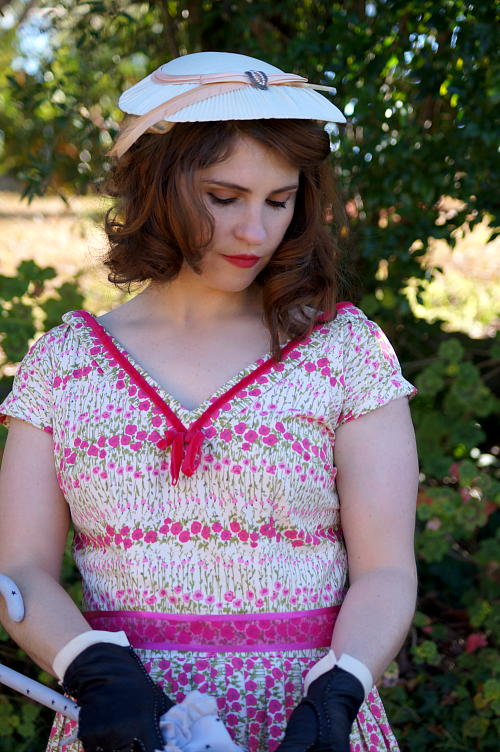 Did you have your heart set on the hat you wanted from the shop and making it a part of your dream outfit? Have 20% off for the rest of August, with the discount code dream when buying any hat from my online shop. I'll be adding some new things before the end of the month too, and they will also be included in the sale! I do have a draft schedule worked out from now until after my maternity leave, but I would also love to hear from you! What do you want to see more of in my designs or blog posts? Again, thanks everyone for a fun competition! The final sequence from my wonderful photoshoot from June with Dee and Mel! 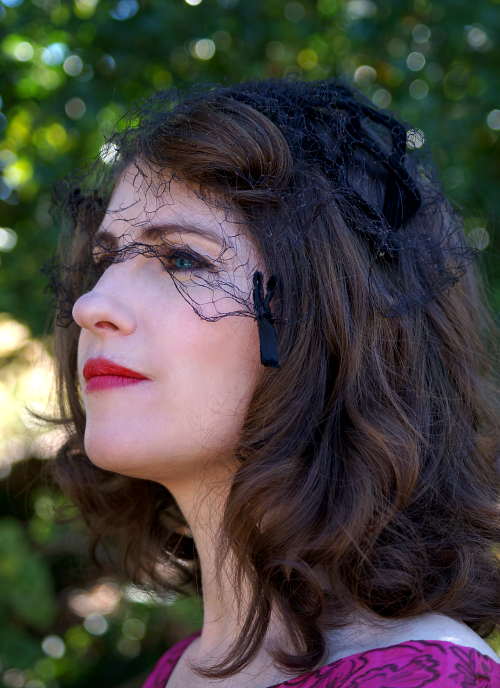 These hats are all already sold, some to my lovely models, and some through the Blackheath Hub. But the photos are so lovely, I still wanted to share them with you. I have since made a copy of this green cloche in blue for someone who fell in love with it when they saw these photos on my facebook page. 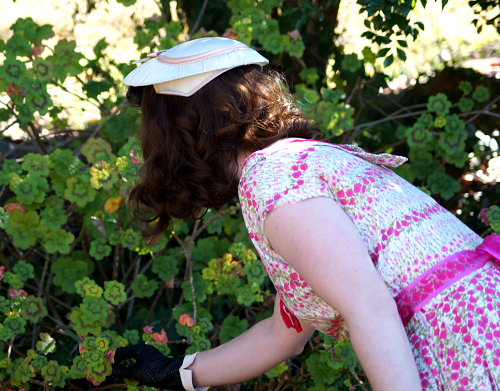 I showed you this pink cloche on me earlier, but this is its new owner, looking fabulous in it, and showing how well it can work with a non-1920s outfit. 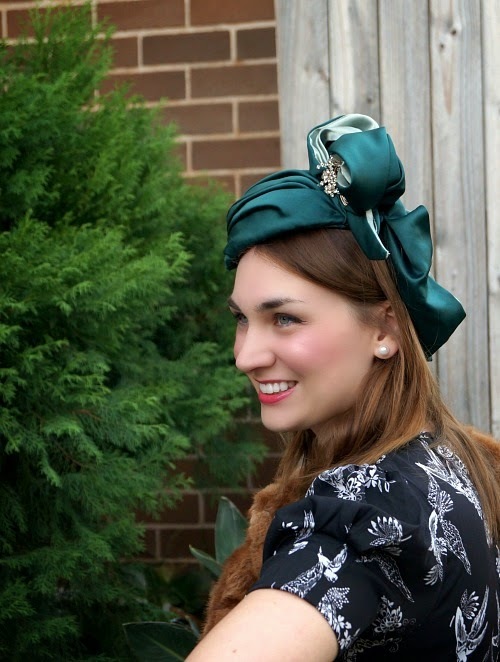 I hardly ever attempt the same hat design twice, but this post features two! 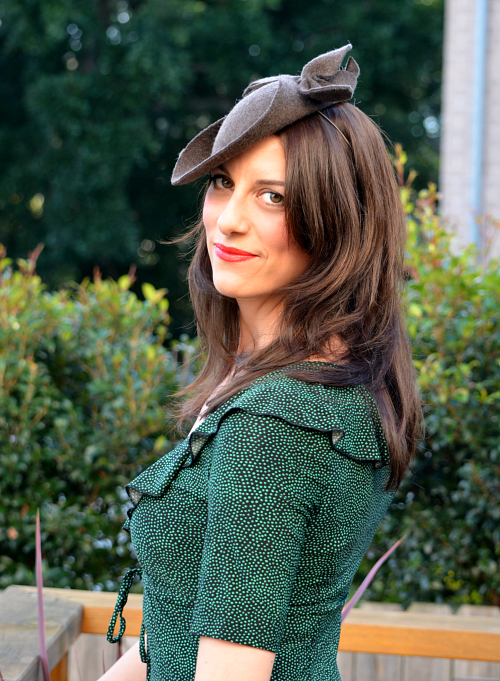 Not only did I remake the green cloche, but this mottled brown felt is a copy of a previous hat. The original was in grey felt, and was a gift for a friend at work, whose generosity with her time and expertise helped me through a difficult year finding my feet teaching in a new faculty. I'm partial to this design for that reason, along with its charming simplicity. 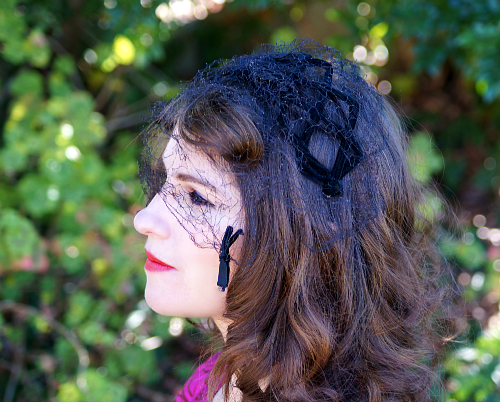 It is a hat that doesn't look like much by itself, but looks gorgeous when worn. I may have to make a third one! 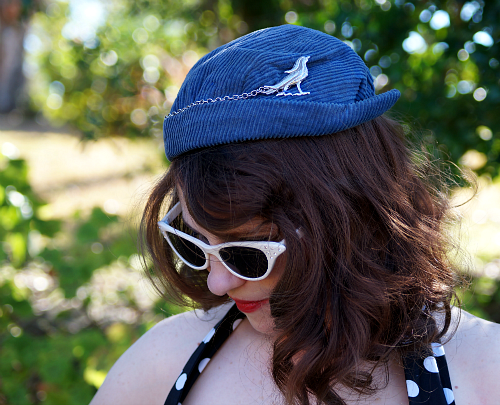 This little red felt cap was inspired partially by a 1940s hat, but I strayed off into my own realm with it. I still feel a forties vibe from it, but I'm not sure whether that is the best way to classify it. I love the button and tails detail, which I would like to use again, whether I repeat this overall design or not. This hat is another one that has been on a long journey from the beginning of its creation to a good photo shoot and a new owner! 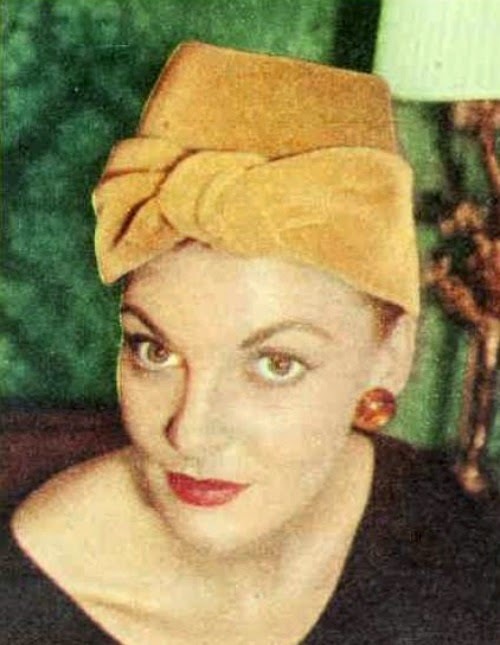 I began with the main front piece, inspired by this 1950s photo, almost a year ago, when I chronicled the recycling of an old costume dress project into this hat. 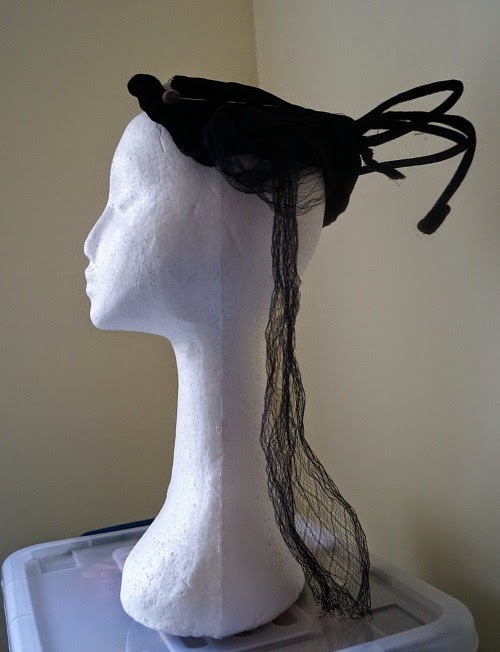 I wasn't happy with using an elastic on it, and so it sat unfinished until the International Millinery Forum, and a class with Jan Wutkowski about vintage bandeau styles. I fell in love with "figure eight" attachments after trying on one of her examples and feeling how comfortable yet secure it was. This was the project I worked on in that class, but it took until June to get great photos of it! Again, I want to try to make something similar, although I wouldn't attempt to repeat the exact design! Too much chaos (not to mention specific parts of the old dress!) went into its making to be able to replicate it. It has been one of my favourite creations, however, so I'm sure to revisit some aspects of it. Really, this has been quite a post of favourites! 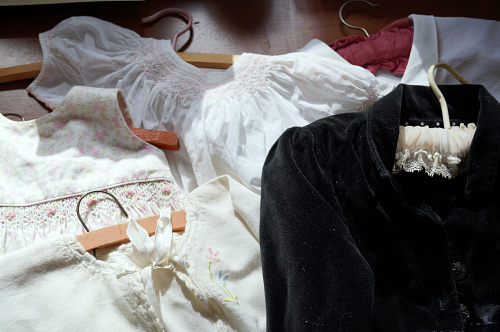 So many delightful ideas - drapey fabrics, sweeping felts, little bows, and vintage buttons! Which of these design features do you like best? I've never done a haul post before, but I had such a fun day shopping recently, that I thought I would do my first. My lovely sister came up and had a baby-free night in our soon-to-be-abolished guest bedroom so we could get there at 9am when the shop opened. She got a surprise bonus of snow, some of which was still lingering by the following afternoon, in shaded enough spots. 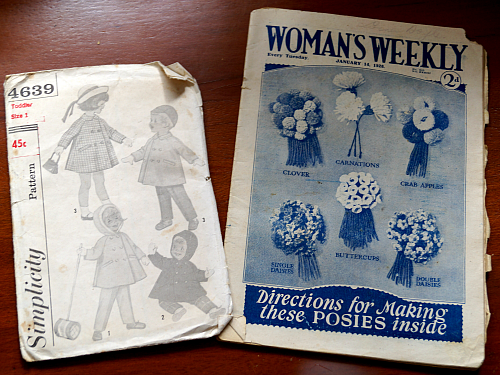 We fell onto the patterns and magazines first. Here are the ones I got, at $1 each. Toddler coat! So adorable. And I couldn't go past flower-making directions. 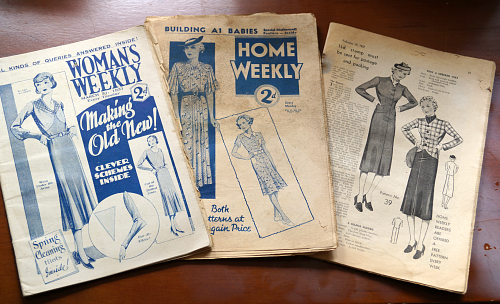 I probably shouldn't take parenting advice from the 1930s, but I love the heading "Building A1 Babies." 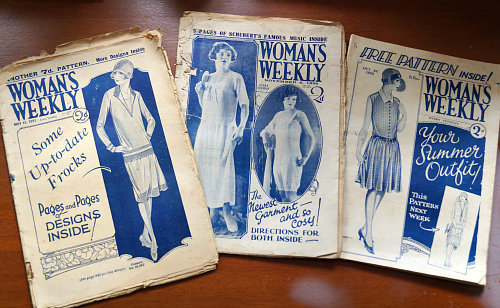 There are some lovely pictures, both for fashions specifically, and illustrating the fiction too. 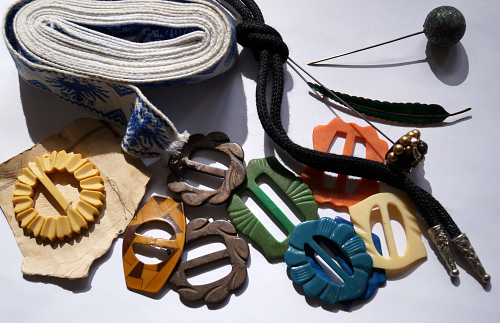 Buckles, some new hat pins, a brooch, and other miscellaneous trims. A roll of vintage veil! There are many metres of this stuff, and it's a lovely pattern. Score! 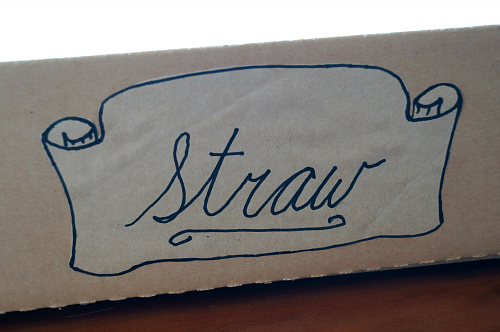 "Do you know what's in the box that says "Straw"?" "So....how much for the whole box?" 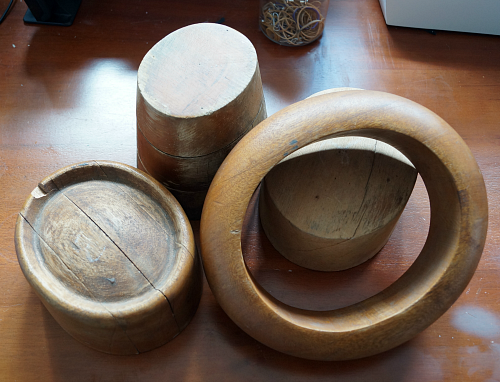 Also, recently, I 'accidentally' bought some new-to-me vintage hat blocks via ebay from a lovely dealer from the Sydney-ish region (the same way I'm from the Sydney-ish region - I'm close enough to go into the city for a day!). In case you don't know, 'accidentally' buying is the result of bidding at the opening amount, maybe a bit over, without any expectation of winning the item. Also, you can do this simultaneously on multiple items. Oops! Still, they are lovely, they were cheap, and I regret nothing! I don't know whether to feel like this post is glorifying spending that I didn't need to do, or celebrating it and making sure I get a lot of enjoyment out of these items. To be honest, I think that one of the problems I have with shopping to much is in getting a rush from the buying moment, but not taking enough time to enjoy the purchases once they are mine. Which, in the case of craft supplies, just means an ever growing hoard of materials and trims that I haven't used yet! I'm planning to do some "stash-busting" sewing days soon, and try to get this mountain under control. Have you entered the giveaway competition yet? Check out the available hats here and then enter at the competition blog post. Entries close on Tuesday 9am AEST, so get in quick!